I had the best Mother's Day today! I slept in till 9.30am. Got woken up to the smells of bacon and eggs. Went to LSS to get DT pack, but it was closed. 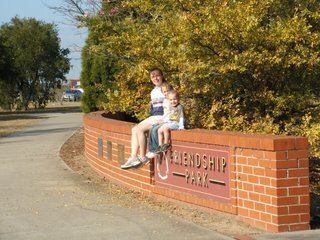 Oh well.Then after Luke woke up from his nap, we went to the park opposite the RAAF base out at Windsor. The kids had a blast! As we were making our way back to the car, Kate and I was having a race on the scooters. I stopped to change legs and I didnt realise I stopped on a crack. I went to take off and the scooter stayed motionless. I however didn't. I went A over T and took a tumble! I was so embarrassed as some people saw me and called out for me to do it again! *dies* But it was really funny and I did have a good ol' laugh at my own expense. So when we got home I took off for a 10km run and was stoked as I went under 1 hour - I did it in 59.07mins. First goal reached! Yay! <---- Dont you just love the colours of Autumn?? I have been very slack of late blog hopping. Hopefully I will get around to it soon and say hi to you all! Beth! You "*dies*"-ed. I'm proud of you! LOL! Happy mothers day, e-mum/sister. rotfl. you're too young to be my mum. silly me. i hope you're (not) offended. Am I making any sense? I think not. So I will shut up. But, nevertheless, happy mothers day. for the next 26 minutes. Belated Happy Mother's day to you! Sounds like you had a great day! Yay - your Mother's Day sounds so nice. I'm cringeing as I think about your fall off the scooter - hope the pride is OK today!! Well done on your run too. Running for an hour is so amazing - you must be thrilled with yourself. Beth, hope you are okay after your tumble. You didn't hurt yourself did you? Happy belated Mother's Day. Glad to hear you got a sleep in and brekky cooked for you. the photos of you and the children are cute. LOL!! That is so funny Beth! congrats on reaching your first goal!! 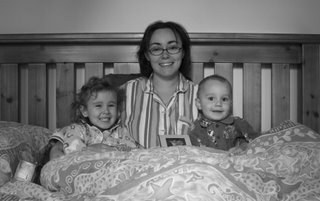 I love this photo of you and the kids in bed together, you will have to scrap that Beth. PS: I emailed you some of my recent layouts so you can see what I have been creating. Hope you like seeing them. Oh no Beth how embarrassing. At least you can laugh huh!!! Yay on the 10k run in under an hour. Fantastic that you reached a goal.